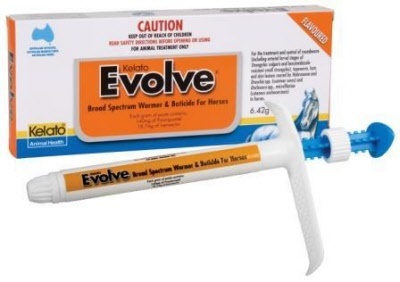 Evolve® is a Broad Spectrum Wormer & Boticide for Horses – a complete worming treatment. With a low volume dosage, palatable flavour and a winged applicator, it is a quick, easy & effective way of worming your horse. The effectiveness of Evolve® is due to the combination ofEvolve’s unique blend of ingredients. Each gram of Evolve contains 142mg of Praziquantel and 18.7mg of Ivermectin, together these two ingredients rid your horse of all parasites. The low dosage of 6.42g makes the process of worming a quick exercise.